First and foremost, I apologize for the quality of the pictures on this post. Might as well apologize for the entire site, as we do not really have a high-quality camera and only use our mobile phones to capture images. I hope my wordy reviews make up for it. 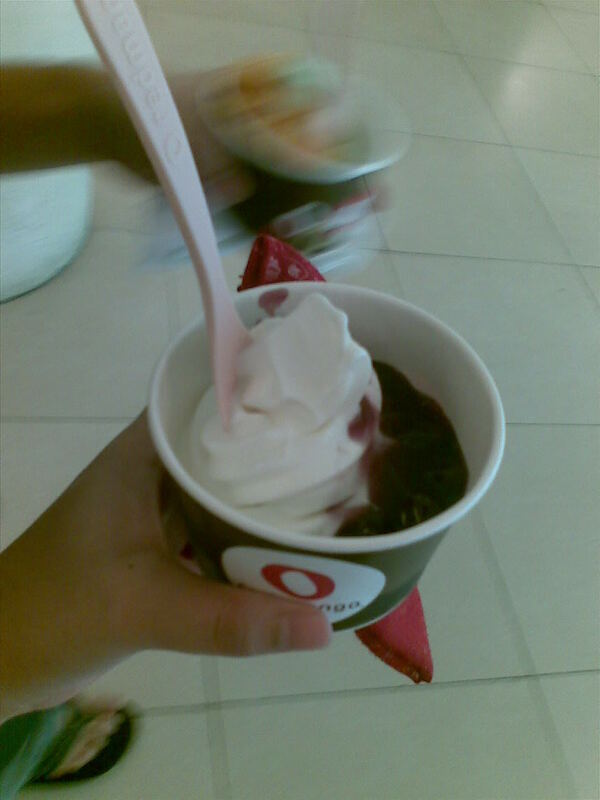 Anyway, just this Sunday, we went to Red Mango at Trinoma. There’s always a long line to this walkway store and most feedback we get from it is positive. Bearing the long line, we decided to try it out. Beloved ordered a small plain yogurt (80 Php) with blueberry toppings. Even though it’s labeled small, the serving is quite generous. 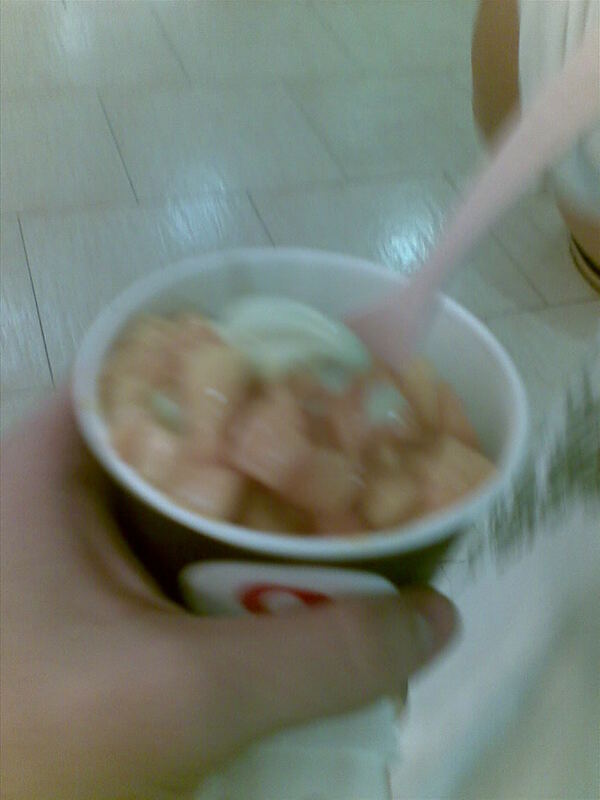 Mine was a small green tea yogurt (85 Php) with mangoes. The toppings are 20 Php per variation and you can put up to three toppings per order. They also have bigger servings for bigger prices, but I’m don’t really remember how much. Since beloved never tried out frozen yogurt before, she was visibly disappointed. She doesn’t like sour stuff, and Red Mango’s frozen yogurt is genuinely pure. There’s no sugar or sweeteners added in their yogurt and all the sweetness would come purely from the topping you add. Yes, it’s quite sour, as expected from unsweetened yogurt, and the first bite would make you cringe in sourness. But its nice creamy texture and coldness makes up for it, and the taste regulates to a more bearable and delicious sourness as you take more bites. The fruits are okay, the mangoes are fresh, sweet, and a bit on the sour side. The blueberries have that balanced sweet and sour taste expected from blueberries. Bottom line is I liked its taste and texture and the quality of toppings. However, I didn’t really like the price. If you’re ever curious of why this shop always has a long queue, don’t attempt to sate your curiosity if you despise sour stuff. Otherwise, bear the wait and you’ll be rewarded with genuine frozen yogurt with fresh toppings which you can nom on the go. Location: Trinoma, 3rd floor outside Fitness First. Recommended for: Health watchers who wants a cool dessert. Not recommended for: Bargain hunters; those who hate sour stuff. Smart nomnomnom tip: Get a bigger size with many toppings and share with friends.